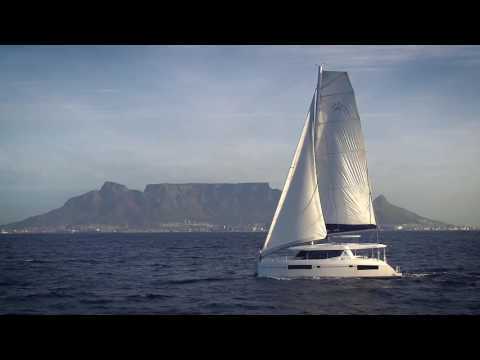 With naval architecture by Simonis & Voogd Yacht Design, and with exterior and interior design by the world-class design team at Robertson and Caine, the Leopard 45 Sailing Catamaran not only builds on the best features of the current Leopard range, but most notably offers new exterior styling and enhanced interior accommodation. The exterior styling has evolved from the more curvaceous deck features on the current Leopard range, into a sharper, more angular look, topped by a sleek new saloon hardtop, which extends from aft cockpit to forward cockpit. Available in a 3 or 4 cabin layout, the Leopard 45 offers the perfect entertainment package with increased aft area with new layout, ergonomically designed open plan saloon and galley, larger forward cockpit, and more onboard area. She’s sleek and nimble, yet comfortable. She incorporates a heritage of Leopards spanning twenty five years of production expertise. In summary, the Leopard 45 Sailing Catamaran delivers uncompromised, exceptional build quality throughout, new, sleek styling, a sensible and practical layout, sailing comfort across all sea states, and features innovative technologies and multiple entertainment areas. 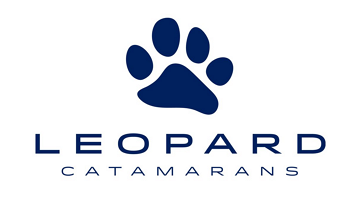 With uncompromised and exceptional build quality, and a pedigree of over 1500 blue water catamarans, Leopard has set the standard for cruising catamarans. Despite its larger living areas and its higher level of sophistication, the Leopard 45 is faithful to its pedigree of robust, easy to maintain, easy to maneuver, blue water catamarans. At Leopard we favor a clear, natural flow. The Leopard 45’s increased area, ergonomically designed open plan saloon and galley, increased forward cockpit and more onboard area make her the ideal catamaran for guest entertaining as well as long-range cruising. Onboard entertaining is accentuated with ample dining space, and forward facing L shaped seating communicating directly with the galley, situated forward. Wide sliding saloon doors afford panoramic views towards the stern, allowing the interior saloon to flow naturally towards the outside aft and forward cockpit. The boat is flooded with natural light during the day and after sunset, illuminated by subtle hidden lighting, with individual spotlights to highlight certain areas. The Leopard 45 has been overhauled with full wrap around panoramic windows, a saloon size overhead skylight and enlarged hull windows. The interior design is modern and simple with an elegant, light finish and grey accent panels. The increased volume of the saloon provides ample space for on-board entertaining. The yacht is available with either a 3 or 4 cabin layout. The 3 cabin layout features two guest cabins in the port hull, both with en-suite heads and shower stalls. The entire starboard hull is dedicated to a spacious owner’s suite with a master cabin, study desk/ vanity and a private head with a large shower stall. In comparison to it’s predecessor, the volume below deck has been increased, making it open and unrestricted. The storage areas are plentiful and will accommodate your requirements whether it be hanging, drawers or under floor storage. The boat is comfortable, private and well- ventilated from multiple points. The atmosphere is enhanced by natural light provided by the enlarge hull windows, portlights and deck flush hatches. Designed for a modern, blue water lifestyle, the Leopard 45 features a raised helm station covered by a hardtop bimini, with direct access from the cockpit and side deck. All sailing lines lead to easily accessible winches, the primary winches being electric, and operated by footswitches. The exterior styling has evolved into a sharper, more angular look, topped by a sleek new saloon hard top, which extends from the aft cockpit to the forward cockpit. Spacious, practical and protected from the sun, the aft deck offers the perfect entertainment area with its ample seating and a clear natural flow through the open plan saloon. Accessible via a weather tight door. the increase forward cockpit provides way access to the fore deck and trampoline. Additionally, the forward cockpit allows for superior ventilation naturally throughout the boat.